The Brazilian came on as a second-half substitute in his side's 2-0 win against Croatia at Anfield on Sunday. It is now anticipated 25-year-old Fred will have a medical at United before completing his switch to Old Trafford for a reported £52m. Brazil coach Tite says he wants his players' domestic futures sorted ahead of this month's World Cup in Russia. "When this happens, and it is inevitable, they are going to come to us and our advice to them is resolve this as soon as you can so your head is back with us and focusing on the national team," he said after Sunday's friendly. "If I was a manager I'd ask to sign him as well." 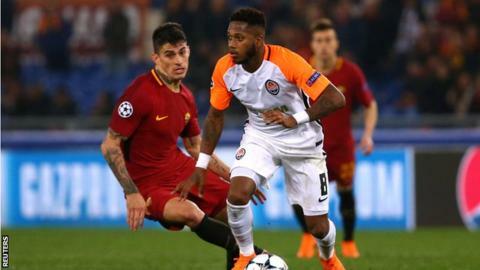 Provided the deal goes through as anticipated, Fred would be United boss Jose Mourinho's first signing of the summer, although he is also closing in on the transfer of 19-year-old Porto full-back Diogo Dalot. Fred joined Shakhtar in 2013 and was part of the Brazil squad for the 2015 Copa America.